[These Independent studies prove the opposite. (also see Articles proving Vitamin C cures infections). 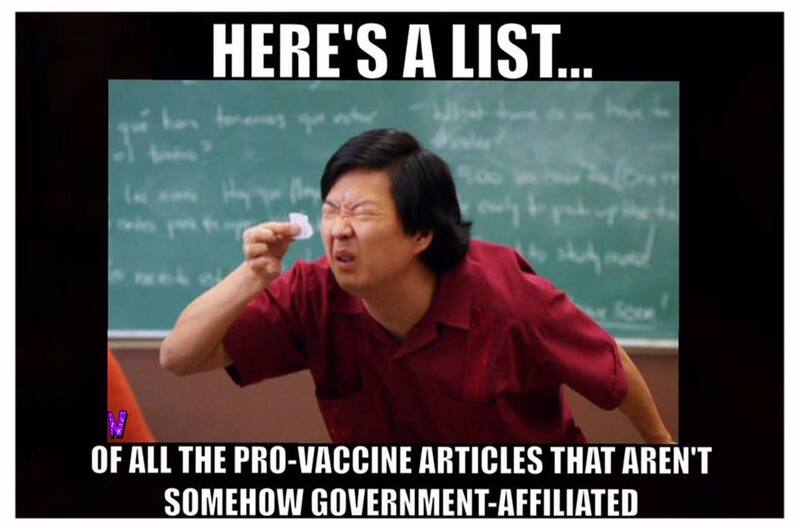 You can see from the Quotes that there is ample scientific evidence vaccines cause autism (Vaccine autism), yet the government and industry keep coming up with studies showing "there is no evidence". This is a conspiracy to suppress the truth. If this MMR goes down it will be the second in a row (see MMR Pluserix & Immravax) That could mean the end of MMR, followed by the vaccine programme, and seeing as Allopathy sits upon vaccination (see), you may glean why they have nailed their colours to the wall on this one, not that a psychopathic industry needs any encouragement in that regard---if you think children come first then you have failed to study the nature of the beast (The Medical Cartel), and medical history (also see 1, 2). A trillion dollar industry rests on this, 98% of which is a hoax. Independent studies that prove it. [2014 May] Taylor, L., Swerdfeger, A., Eslick, G. (2014). Vaccines are not associated with autism: An evidence-based meta-analysis of case-control and cohort studies. DeStefano Kennedy Jr., Robert F.
The purpose of this review is to examine these six publications [21–26] which were “overseen” by the CDC and which claim that prenatal and early childhood vaccine-derived Thimerosal exposures are not related to the risk of a subsequent diagnosis of autism or autism spectrum disorder (ASD). This review analyzes possible reasons why their published outcomes are so different from the results of investigations by multiple independent research groups over the past 75+ years. The review begins with an examination of the Madsen et al. study. 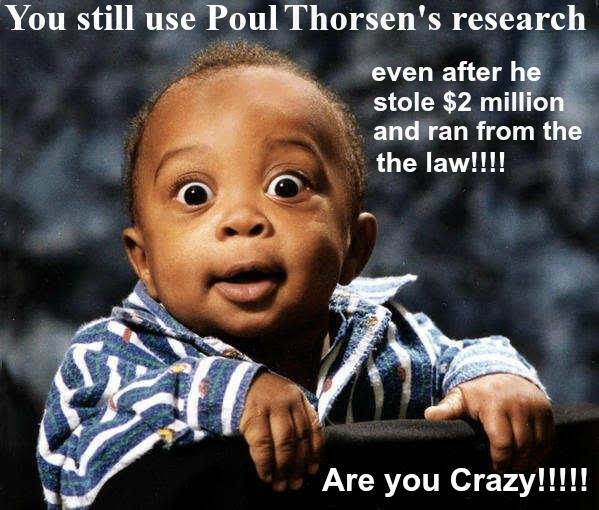 [2011 April] Indicted Researcher Poul Thorsen: Autism Speaks' Original Trailblazer In May 2000, one week before the infamous Simpsonwood meeting, Poul Thorsen suggested blazing a new trail to the CDC - disguising the role of vaccines in the autism epidemic by using data from Denmark. 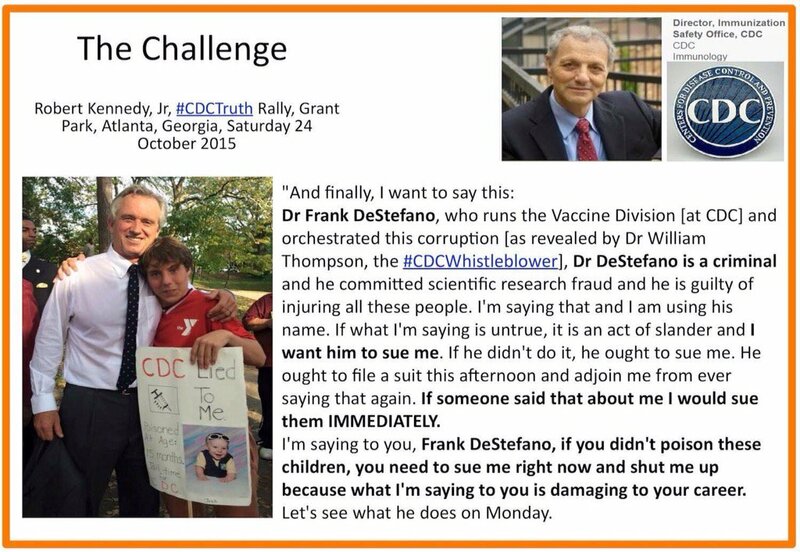 He made this suggestion to CDC staffer, NAAR/Autism Speaks scientific adviser and (Bernie) Marcus Institute board member Dr. Marshalyn Yeargin-Allsopp.. The CDC funded the project; NAAR supplemented. In 2002, NAAR, who later merged with Autism Speaks, provided $105,300 to supplement the CDC project. NAAR walk money helped Thorsen blaze his trail of using data from Denmark to disguise the potential role of vaccines in the autism epidemic. "Vaccines and Autism - The Wrong Argument - rev. 1 (24 February 2011; 9 pages)" King, PhD, Paul G. The keys to maintaining any unsafe commercial activity are misdirection, disinformation, big lies, and pervasive propaganda. To be effective, the commercial interests use persons whom the public trusts. These spokespersons then promote the activity. They lie about its risks. They portray an activity that is less than safe as not only safe but also desirable. In the place of proof of safety, these propagandists invariably tout the "lack of evidence of harm". In addition, the promoters of an unsafe activity do all they can to bury studies that question the activity’s safety under an avalanche of "recognized" studies that are peddled as showing "no evidence of harm". Those who benefit from the commercial activity also do all they can to discredit those persons who dare to publish studies that question the safety of the activity. Further, they use their wealth to buy other "experts" to refute any link between the activity and the harm that it inflicts on the "general public". 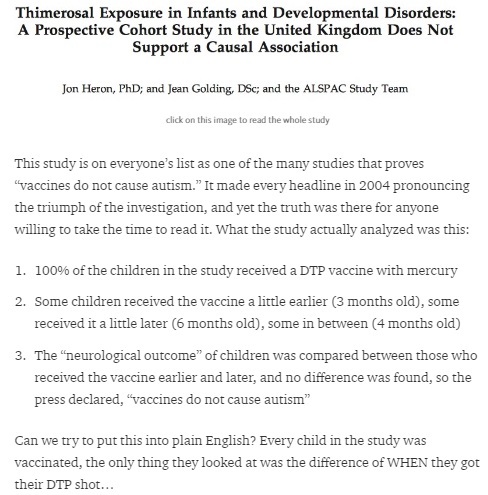 [2010 Sept] SafeMinds Comments on Pediatrics Study on Thimerosal and Vaccines Prenatal and Infant Exposure to Thimerosal From Vaccines and Immunoglobulins and Risk of Autism. Price, CS. et. al. Pediatrics 2010;126:656-664. [2010 March] The Fallacy of Thimerosal Removal & Autism Increase: A Failure of Science, A Bigger Failure to Children Worldwide By Jake Crosby What is truly sad is that this big hungry lie continues to be repeated in order to justify the population-wide poisoning of countless infants and fetuses. [2009 Jan] The Vaccine Hard Sell at Pediatrics By Michael Wagnitz, B.S. [Jan 2008] Dr. Robert Schechter. Jan 2008. Continuing Increases in Autism Reported to California's Developmental Services System. Arch Gen Psychiatry. 2008;65(1):19-24. How Mercury Was Absolved: Creativity, Collusion and Censorship by Jeffrey Allen Trelka, M.Ed. Pichichero, M. et. al. 2002. "Mercury concentrations and metabolism in infants receiving vaccines containing thiomersal: a descriptive study." The Lancet 360: 1737 - 1741. [Nov 2002] Autism and Inflammatory Bowel Disease in Finland: A Recent Increase.---- F. Edward Yazbak, MD, FAAP. [June 2002] The Davis et al Paper ( Arch Ped Adolesc Med 2001; 155: 354-359) by Walter O. Spitzer, M.D. 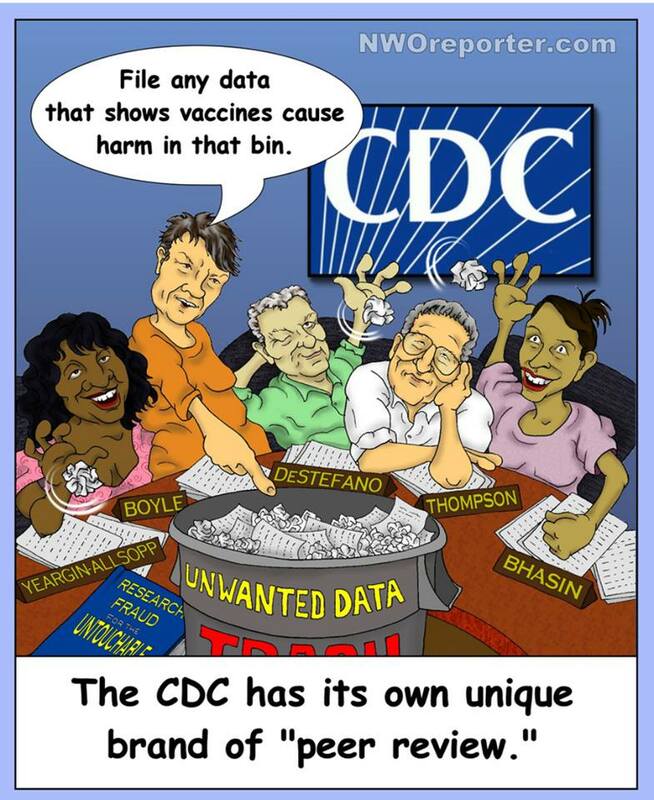 We have tolerated the junk science that has covered up the true cause of this epidemic at a considerable cost to science, the public, and our very way of life in this country. Is it stretch to realize that by putting our collective heads in the sand about the autism epidemic we have made it possible for the destruction of our very civilization? LES INCOMPETANTS: OPEN LETTER TO THE AAP By K. Paul Stoller, M.D. 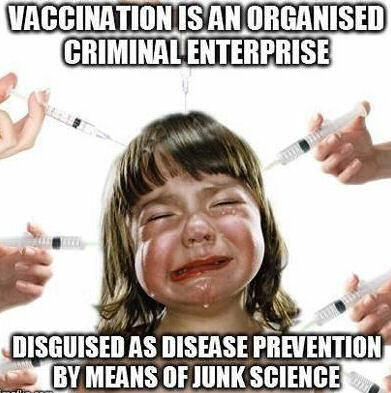 In response to the overwhelming science, CDC and the pharmaceutical industry ginned up four European studies designed to disguise the link between autism and Thimerosal. Their purpose was to provide plausible deniability for the consequences of their awful decision to allow brain-killing mercury to be injected into our youngest children. 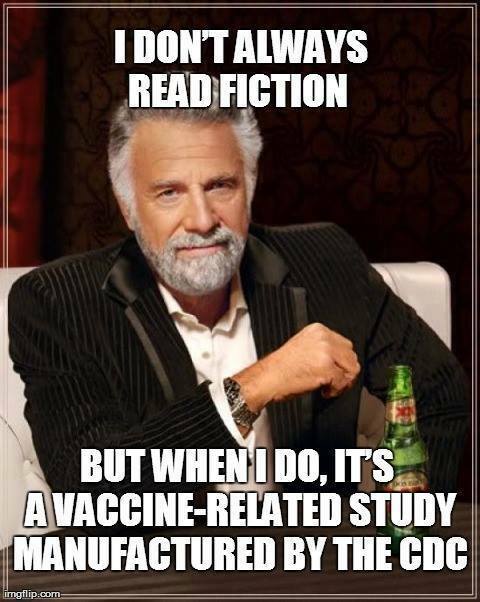 Those deliberately deceptive and fatally flawed studies were authored by vaccine industry consultants and paid for by Thimerosal producers and published largely in compromised journals that neglected to disclose the myriad conflicts of their authors in violation of standard peer-review ethics. Attack on Mothers by Robert F. Kennedy Jr.
"At this point, it is believed that about 10% of cases of autism can be accounted for genetically."--B.J. Freeman, Ph.D.